Los Angeles, CA (Dec. 9, 2015) – Get inspired and follow one man’s journey to find his faith in the moving drama Born to Win arriving on Digital HD January 19 and DVD (plus Digital) and On Demand February 2, 2016 from Lionsgate Home Entertainment. 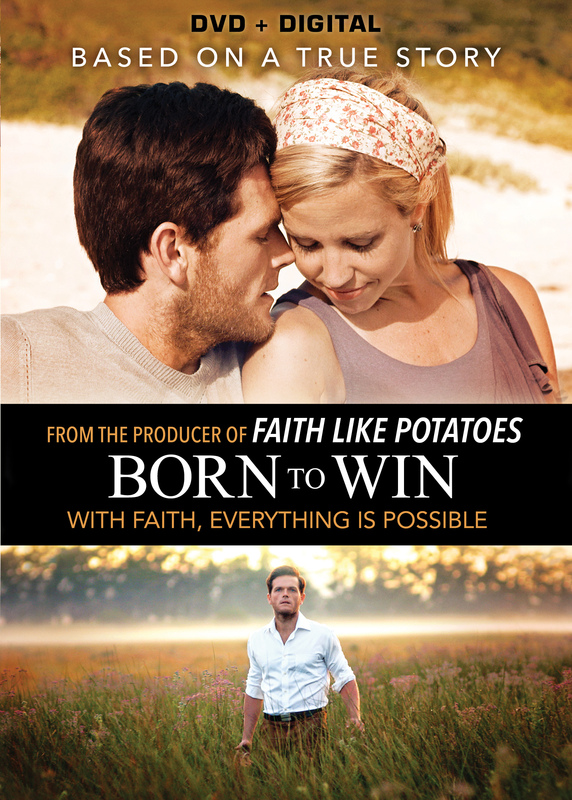 From the producer of the hit faith film Faith Like Potatoes, which sold over 2.2 million DVDs in 17 languages worldwide, Born to Win is based on the true story of Leon Terblanche, a teacher at a school for disabled children, who found himself confronted with the question: “Where is God?” This sets him on a journey where he discovers that he has never been alone through all the hurt and brokenness of his past. Leon learns that no matter how broken you are, God is always our only living hope. Born to Win shows how God turns the hurt, frustration and emptiness of a man into hope, faith and victory to inspire people to be the winners they were born to be. Theatrically released in South Africa in 2014 and recipient of the Golden Crown Award for Best Evangelistic Film in 2015 (ICVM), the poignant film is written and directed by Frans Cronjé and features touching performances from an outstanding cast including Greg Kriek as Leon Terblanche (Momentum), Leoné Pienaar (Break Away), Nadia Beukes (Mooirivier), Cobus Venter (Skin), Marie Cronje (Faith Like Potatoes), Dorette Potgieter (Citizen Verdict), Anrich Herbst (Mandela: Long Walk to Freedom), Sylvia Mdunyelwa-Kobus (Tula Tula), Garth Collins (Zulu), Merlin Balie (Break Away), Tim Theron (Mooirivier) and Leandie Du Randt (Semi-Soet). A Frans Cronjé film. In association with Ocean Avenue Entertainment. The Born to Win DVD will be available for the suggested retail price of $19.98. Title Copyright: Program Content and Package Artwork: © 2014 Born Winners Pty Ltd. All Rights Reserved. Package Design and Summary: © 2016 Lions Gate Entertainment Inc. All Rights Reserved. Ocean Avenue Entertainment, Inc. is the destination for productions that offer hope to audiences looking for inspiration in entertainment. It is committed to releasing films and television programming that are inspiring and redemptive. For more information, please visit www.oceanave.tv. Lionsgate is a premier next generation global content leader with a strong and diversified presence in motion picture production and distribution, television programming and syndication, home entertainment, digital distribution, new channel platforms, video games and international distribution and sales. With Pilgrim Studios recently joining the Lionsgate family, the Company has nearly 80 television shows on 40 different networks spanning its primetime production, distribution and syndication businesses. These include the critically-acclaimed hit series Orange is the New Black, the multiple Emmy Award-winning drama Mad Men, the hit broadcast network series Nashville, the syndication success The Wendy Williams Show, the acclaimed drama Manhattan and the breakout series The Royals. Its feature film business has been fueled by such successes as the blockbuster first three installments of The Hunger Games franchise, the first two installments of the Divergent franchise, Sicario, The Age of Adaline, CBS/Lionsgate’s The DUFF, John Wick, Now You See Me, Roadside Attractions’ Love & Mercy and Mr. Holmes, Lionsgate/Codeblack Films’ Addicted and Pantelion Films’ Instructions Not Included, the highest-grossing Spanish-language film ever released in the U.S.